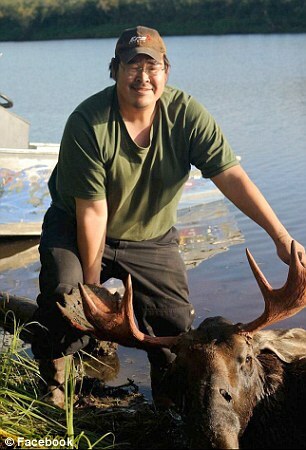 Guide Jeff Thomas Burruss, 40, of Haines, Alaska. 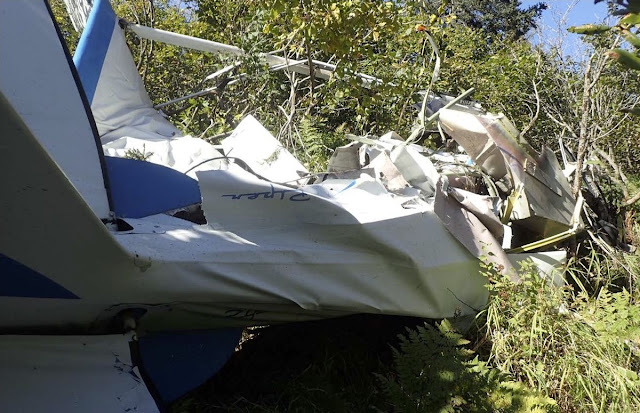 On August 31, 2016, about 1001 Alaska daylight time, a turbine-powered Cessna 208B (Grand Caravan) airplane, N752RV, and a Piper PA-18-150 (Super Cub) airplane, N82452, were destroyed when they collided in midair near Russian Mission, Alaska. The airline transport pilot and the two passengers onboard the Cessna and the commercial pilot and the passenger onboard the Piper sustained fatal injuries. The Cessna was registered to N752RV, LLC, Fairbanks, Alaska, and operated by Hageland Aviation Services, Inc., dba Ravn Connect, Anchorage, Alaska, flight number 3190, a visual flight rules (VFR) scheduled passenger flight, under the provisions of Title 14 Code of Federal Regulations (CFR) Part 135. Company flight following procedures were in effect for the scheduled passenger flight, which departed Russian Mission Airport (PARS), Russian Mission, Alaska, about 0958 and was destined for Marshall Don Hunter Senior Airport (PADM), Marshall, Alaska. 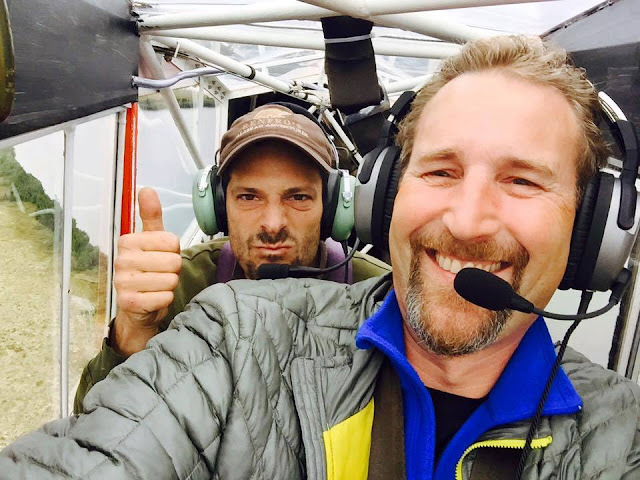 The Piper was registered to DioAir, LLC, Bethel, Alaska, and operated by Renfro's Alaskan Adventures, Inc., Bethel, as a VFR guided hunting operation flight, under the provisions of Title 14 CFR Part 91. 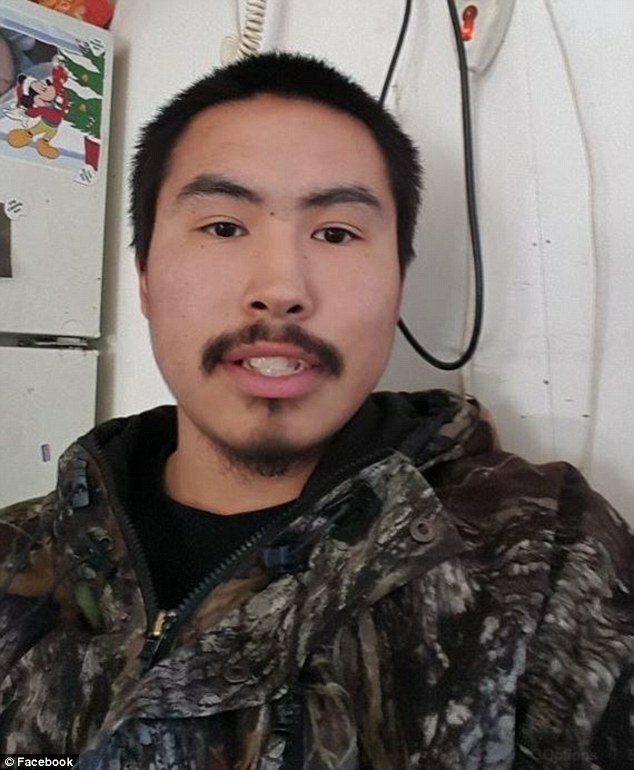 Company flight following procedures were in effect for the flight, which departed Bethel Airport (PABE), Bethel, Alaska, about 0907, and was transporting the passenger to a remote hunting camp about 20 miles northwest of Russian Mission. Visual meteorological conditions (VMC) prevailed in the area at the time of the accident. The operator of the Cessna reported that the flight was scheduled to arrive at PADM at 1017. In addition to the pilot, onboard the airplane was a company employee (non-pilot) and a private individual traveling to Marshall. When the airplane did not arrive as scheduled, the company village agent at PADM notified the Ravn Connect operational control center (OCC) in Palmer, Alaska, which initiated overdue airplane procedures. The OCC contacted two company airplanes near Russian Mission and provided the last latitude and longitude coordinates from the Cessna's Automatic Dependent Surveillance-Broadcast (ADS-B) system. The two company airplanes then flew to the area of the last coordinates and located the accident site. The pilots of the two company airplanes reported their findings back to the OCC. The owner and master guide-outfitter of the hunting/fishing expedition company that operated the Piper reported that the purpose of the flight was to drop off a guide, who was a company employee, along with hunting and field gear at a hunting camp. He reported that he also was flying another company guide to a different hunting camp in another airplane, and that he departed from PABE about 15 minutes after the Piper. The owner reported that he delivered the guide to the hunting camp about 1030, then overflew the Piper's intended destination and saw that the Piper was not present. The owner radioed the company headquarters at PABE for a status update on the Piper and was provided the Piper's last latitude and longitude coordinates from the company's flight following system. The owner then flew to the area of the last coordinates and located the accident site. The owner reported his findings back to the company headquarters. Flight track information recovered from the ADS-B system on the Cessna and a Garmin GPSMAP 296 GPS device on the Piper indicated that the Cessna departed runway 17 at PARS about 09:58:50. At that time, the Piper was about 5.1 nautical miles (nm) west and 1.3 nm south of the Cessna, flying northbound (about 003°) in level flight between 1,700 and 1,800 ft above mean sea level (msl), at an airspeed about 70 knots (kts). Shortly after takeoff, the Cessna entered a climbing right turn to the northwest, rolling onto a heading of 300° at 09:59:41, while climbing through 850 ft msl and accelerating through about 120 kts. The Cessna continued climbing and leveled about 1,760 ft msl at 10:01:00, while accelerating through 138 kts. At that time, the airplanes were 1.1 nm apart and converging. The airplanes continued to converge without further maneuvering until they collided at 10:01:28 at an altitude of 1,760 ft msl. The closure rate at the time of collision was about 145 kts, with the Piper approaching the Cessna from ahead and to the left and the Cessna approaching the Piper from the right. Both operators reported that there were no preimpact mechanical failures or malfunctions with the airframe or engine that would have precluded normal operation for each airplane. The Cessna pilot, age 48, held an airline transport pilot certificate with ratings for airplane single-engine land, airplane multiengine land, and instrument airplane. His most recent first-class Federal Aviation Administration (FAA) medical certificate was issued on January 15, 2016 and contained a limitation that he must wear lenses for distant vision and have glasses for near vision. According to the operator, the pilot had about 18,810 total hours of flight experience. The operator's pilot training records showed no deficiencies; the accident pilot had completed all required training, including a competency check ride on March 18, 2016. The Piper pilot, age 44, held a commercial pilot certificate with ratings for airplane single-engine land, airplane single-engine sea, airplane multiengine land, and instrument airplane. His most recent second-class FAA medical certificate was issued on August 8, 2016, with no limitations. According to the operator, the pilot had about 5,000 total hours of flight experience. Operator: Hageland Aviation Services, Inc. The fixed-gear, high-wing, single-engine Cessna airplane was manufactured in 2014 and was configured with seating for the pilot, a co-pilot, and 9 passengers; it also had a belly cargo pod. The airplane was powered by a Pratt & Whitney Canada PT6A-140 turbine engine. The airplane's primary base color was white with red and black accent lines, white wings, a black belly cargo pod, a chrome propeller spinner, and a grey Hartzell propeller. The airplane had 811 hours in service at the time of its most recent approved aircraft inspection program inspection, which was completed on July 18, 2016.
Review of the airplane's maintenance records indicated no mechanical discrepancies with the airframe, engine, or propeller. The tailwheel-equipped, high-wing, single-engine Piper airplane was manufactured in 1978 and was configured with tandem seating for the pilot and a passenger; it also had a belly cargo pod. The airplane was powered by a Lycoming O-320 reciprocating engine. The airplane's primary base color was white with blue accent lines, white wings with blue leading edges, a white belly cargo pod, a blue propeller spinner, and a black McCauley propeller. The airplane had 3,559 hours in service at the time of its most recent annual inspection, which was completed on May 26, 2016. The National Transportation Safety Board (NTSB) investigator-in-charge (IIC) and two air safety investigators from the NTSB, along with a team of Alaska State Troopers (AST) traveled to the accident site on September 1, 2016. The team members flew in on an AST helicopter and hiked into the locations for both wreckage sites. 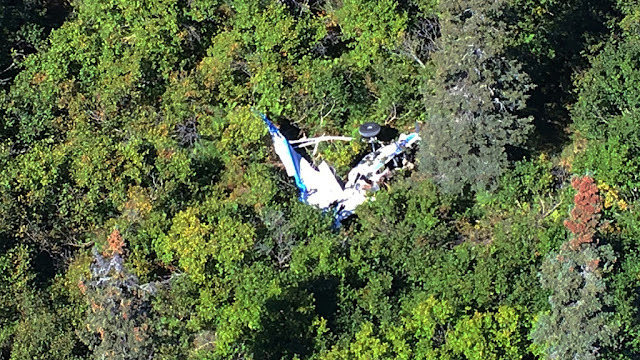 Two FAA aviation safety inspectors (ASI) conducted aerial surveys of the two wreckage sites via a commercial helicopter. Both wreckage sites were located in areas of rolling hills with heavy vegetation about 10 ft tall and populated with various alder trees, spruce trees, and birch trees. The main wreckage of the Cessna came to rest about 1/2 mile west of the Piper. The airplane's initial impact point, located at an elevation of about 610 ft msl, exhibited disturbed terrain and vegetation consistent with a nose-down attitude at the time of impact. The engine was buried in dirt at the bottom of the impact crater. Various avionics boxes were scattered throughout the impact crater and in the immediate surrounding area. The impact crater was located about 144 ft from the main wreckage; the debris field was oriented on an approximate 231° heading. Portions of both wings were located about halfway between the impact crater and the main wreckage. Additionally, the main landing gear separated from the fuselage, along with one propeller blade, and were found near the wing pieces between the impact crater and main wreckage. The fuselage and the empennage, while separated, were collocated in the main wreckage. The area of the main wreckage was about 15 ft wide by 25 ft long with disturbed terrain and vegetation. The fuselage was inverted and was heavily damaged, with cargo scattered throughout the cabin. The vertical stabilizer and rudder were crushed and torn from impact. Most of the visible sections of the fuselage, both wings, and the empennage were heavily coated with dirt from the impact crater. Flight control continuity could not be established due to extensive impact damage. All major structural components were accounted for at the site, with the exception of a portion of the outboard left wing and a portion of the outboard left horizontal stabilizer, which were located about 430 ft southwest. The wreckage came to rest in a densely-forested area at an elevation of about 580 ft msl. The nose of the airplane was oriented on a heading of about 340°. The fuselage was located on its right side with the top portion missing. The fuselage was bent and buckled throughout. The right wing was separated and was located about 50 ft east of the fuselage. The left wing was separated and was located adjacent to the fuselage. The empennage was relatively intact. Except for the missing upper fuselage, the cockpit area appeared intact. Both main landing gear with tundra tires were present as was the tailwheel. The engine and propeller assembly appeared intact on the airframe. Flight control continuity could not be established due to extensive impact damage. All portions of the airplane were accounted for at the wreckage site, except for the propeller spinner and the left wing leading edge wing root fairing. The spinner was located about 630 ft southwest of the main wreckage and the left wing leading edge wing root fairing was not recovered. The wreckage of both airplanes was recovered and transported to a secure facility in Wasilla, Alaska, for further examination. The wreckage for both airplanes was examined by the NTSB IIC, an NTSB air safety investigator, and the NTSB Airworthiness Group. An air safety investigator from Pratt & Whitney Canada was present to examine the engine from the Cessna. During the follow-up examinations, no preimpact mechanical malfunctions or failures were noted for either airplane. An examination of the Cessna's outboard left wing showed a flat impact impression on the leading edge and upper skin between wing station (WS) 293 and WS 298 with black and white paint transfer. There was a distinct line between the black and white paint transfer areas. An examination of the Piper's right forward wing strut revealed that black anti-skid paint had been applied to the strut from the lower end up about 88 inches with white paint above. The Piper's right forward wing strut was flattened and deformed in the paint transition area and along most of its length. All of the fracture surfaces associated with both airplanes had a dull, grainy appearance consistent with overload separation. Refer to the Airworthiness Group Chairman's Factual report in the public docket for more information. Due to the extensive damage sustained to the Cessna's cockpit components, no postaccident operational test of the transceiver was possible. Postaccident operational testing of the Piper's transceiver revealed a primary active radio frequency of 123.675 MHz, and a non-active secondary frequency of 122.90 MHz. The common traffic advisory frequency used at both PARS and PADM was 122.90 MHz. Neither airport was tower-controlled. Both airports were within Class G airspace with Class E airspace starting at 700 ft agl. The area between the two airports was classified as Class G airspace. For both Class E airspace and Class G airspace, there is no regulatory requirement for airplanes to be equipped with two-way radio communications. The location of the midair collision was located at a point-in-space in Class G airspace, right outside of the Class E airspace border of PARS. No FAA radar coverage existed in the accident area. Neither airplane carried, nor was required to carry, a crashworthy flight data recorder. 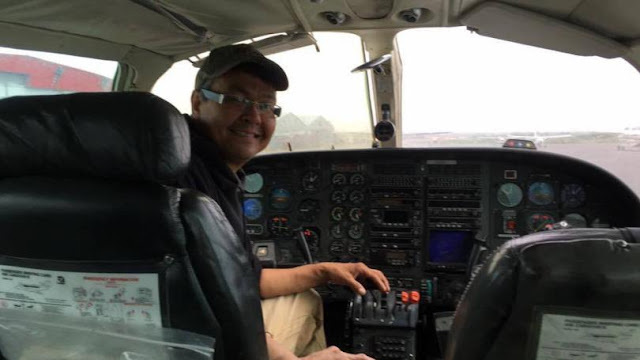 The Alaska State Medical Examiner, Anchorage, Alaska, conducted an autopsy of the Cessna pilot. The cause of death was attributed to blunt impacts and multiple injuries. Due to the level of trauma, the autopsy was inconclusive for the presence of natural disease. The FAA's Bioaeronautical Sciences Research Laboratory, Oklahoma City, Oklahoma, performed toxicology tests on specimens from the pilot. Carbon monoxide and cyanide tests were not performed. Ethanol was detected in muscle at 0.01 mg%, and no drugs were detected in muscle. It could not be determined if some or all of the ethanol was from sources other than ingestion. 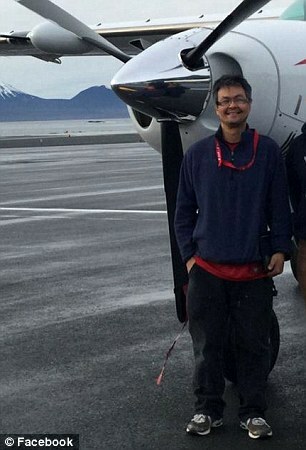 The Alaska State Medical Examiner, Anchorage, Alaska, conducted an autopsy of the Piper pilot. The cause of death was attributed to multiple blunt force injuries. The FAA's Bioaeronautical Sciences Research Laboratory, Oklahoma City, Oklahoma, performed toxicology tests on specimens from the pilot that were negative for carbon monoxide and ethanol. Cyanide tests were not performed. Naproxen was detected in urine. It is unknown if the pilot was prescribed naproxen by a medical doctor. Naproxen is a medication available in two formulations, prescription and over-the-counter (OTC). Prescription naproxen is used to relieve pain, tenderness, swelling, and stiffness caused by osteoarthritis, rheumatoid arthritis, ankylosing spondylitis and other similar conditions. OTC naproxen is used to reduce fever and to relieve mild pain from headaches, muscle aches, mild arthritis, the common cold, toothaches, and backaches. Naproxen is in a class of medications called non-steroidal anti-inflammatory drug. An Aircraft Performance and Cockpit Visibility study was conducted. ADS-B data from the Cessna and onboard GPS data from the Piper were used to calculate the position and orientation of each airplane in the minutes preceding the collision. The visibility study indicated that the Cessna and the Piper would have initially appeared as relatively small, slow-moving objects in each pilot's windows (their fuselages spanning less than 0.5° of the pilot's potential field of view, which is equivalent to the diameter of a penny viewed from about 7 ft away). About 10 seconds before the collision, the airplanes would have begun to appear to grow in size suddenly (the "blossom" effect). From about 2 minutes before the collision, neither airplane would have been obscured from the other pilot's (nominal) field of view by cockpit structure, although the Cessna would have appeared close to the bottom of the Piper's right wing and near the forward edge of its forward wing strut. The ADS-B and GPS data were also used to determine the cockpit display of traffic information (CDTI) data that could have been presented to the pilots had both airplanes been equipped to both receive and provide this information. CDTI uses the ADS-B system to drive a traffic situation display in the cockpits of appropriately-equipped aircraft, and optionally to also provide an aural and visual alert of conflicting traffic. The FAA implemented ADS-B technology in Alaska, and the Cessna was equipped with ADS-B Out, which broadcast the airplane's GPS position and other data to ADS-B ground stations and to other aircraft (to receive this information, other aircraft would have to be equipped with ADS-B In; the Cessna was not so equipped, and so would not have been able to receive ADS-B Out messages broadcast from nearby aircraft). GPS data and avionics provide pilots with situational awareness by displaying the airplane's position over terrain; if their aircraft are also equipped with ADS-B In (and the appropriate displays), ADS-B Out messages from other aircraft can warn pilots of the presence of other ADS-B-equipped aircraft that may be present. For the ADS-B system to be able to provide the traffic information required to drive the CDTI displays and alerts of two aircraft that are in danger of a collision, both aircraft must have ADS-B Out and ADS-B In installed. ADS-B Out data from the Cessna was recorded by the FAA and provided to the NTSB. The Cessna had ADS-B Out, but it did not have ADS-B In or any cockpit display of CDTI data; it was not required to be ADS-B In or CDTI equipped at the time of the accident. The Piper was not ADS-B equipped at the time of the accident, nor was it required to be. Had the airplanes been equipped to display CDTI data, the system could have aurally alerted the pilots to the presence of the other airplane and presented precise bearing, range, and altitude information about each target up to 39 seconds before the collision. A CDTI display would have presented the relative positions of the two airplanes visually to each pilot as early as when the Cessna became airborne: about 2 minutes 39 seconds before the collision. For more information, refer to the Aircraft Performance and Cockpit Visibility Study and the ADS-B data in the public docket. Hageland Aviation Services, Inc., was a Title 14 CFR Part 135 certificated operator, providing both scheduled (commuter) and on-demand flights under the brand Ravn Connect. Company pilots were based at various airports throughout Alaska. All flights were planned and released from the Hageland OCC in Palmer. Hageland is a party to the NTSB investigation. 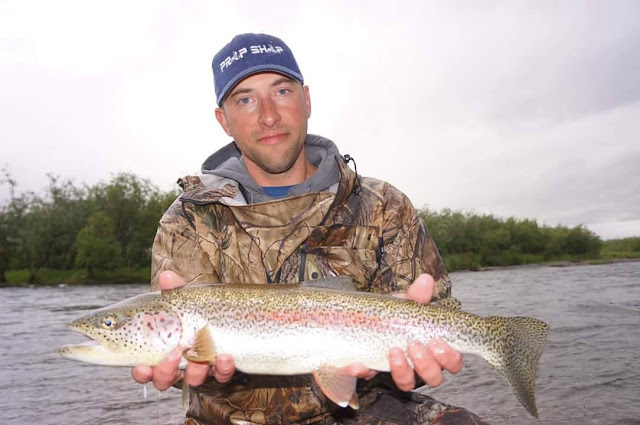 Renfro's Alaskan Adventures, Inc., was a Title 14 CFR Part 91 operator, providing both guided and unguided hunting packages, along with fishing packages. The company conducted operations throughout Alaska. All flights were planned and departed from company headquarters at PABE. Renfro's was originally a party to the NTSB investigation, but during the NTSB Party Member review process of the accident report, it was discovered that Renfro's had violated the NTSB Party Member process in accordance with Title 49 CFR Part 831.11 by improperly divulging privileged information it had received by virtue of its party status. Consequently, Renfro's party status was revoked on November 15, 2018. Refer to the Renfro's Alaskan Adventures, Inc. NTSB Party Member Removal Letter in the public docket. Pilots should also keep in mind their responsibility for continuously maintaining a vigilant lookout regardless of the type of aircraft being flown. Remember that most midair collision accidents and reported near midair collision incidents occurred during good VFR weather conditions and during the hours of daylight. Cockpit workload and other factors reduce the time that pilots spend in traffic scans. However, even when pilots are looking out, there is no guarantee that other aircraft will be sighted. Most cockpit windscreen configurations severely limit the view available to the pilot. The available view is frequently interrupted by obstructions such as window-posts which totally obscure some parts of the view and make other areas visible to only one eye....Visual scanning involves moving the eyes in order to bring successive areas of the visual field onto the small area of sharp vision in the centre of the eye. The process is frequently unsystematic and may leave large areas of the field of view unsearched….The physical limitations of the human eye are such that even the most careful search does not guarantee that traffic will be sighted….An object which is smaller than the eye's acuity threshold is unlikely to be detected and even less likely to be identified as an approaching aircraft….The human visual system is better at detecting moving targets than stationary targets, yet in most cases, an aircraft on a collision course appears as a stationary target in the pilot's visual field. The contrast between an aircraft and its background can be significantly reduced by atmospheric effects, even in conditions of good visibility. An approaching aircraft, in many cases, presents a very small visual angle until a short time before impact. …In addition, complex backgrounds such as ground features or clouds hamper the identification of aircraft via a visual effect known as 'contour interaction'. This occurs when background contours interact with the form of the aircraft, producing a less distinct image. Even when an approaching aircraft has been sighted, there is no guarantee that evasive action will be successful. The "see-and-avoid" concept has long been the foundation of midair collision prevention. However, the inherent limitations of this concept, including human limitations, environmental conditions, aircraft blind spots, and operational distractions, leave even the most diligent pilot vulnerable to the threat of a midair collision with an unseen aircraft. Technologies in the cockpit that display or alert of traffic conflicts, such as traffic advisory systems and automatic dependent surveillance–broadcast (ADS-B), can help pilots become aware of and maintain separation from nearby aircraft. Such systems can augment reality and help compensate for the limitations of visually searching for traffic. The Alaskan Aviation Safety Foundation has published Safety Briefing: Avoiding A Midair Collision in Alaska – En Route Traffic Advisory Reminders. This document discusses midair collision avoidance reminders while conducting flight operations in Alaska and advises pilots to treat remote flying areas with the same situation awareness as flying in an area of congested traffic. (1) The IIC may designate one or more entities to serve as parties in an investigation. Party status is limited to those persons, Federal, state, or local government agencies and organizations whose employees, functions, activities, or products were involved in the accident and that can provide suitable qualified technical personnel to actively assist in an investigation. To the extent practicable, a representative proposed by party organizations to participate in the investigation may not be a person who had direct involvement in the accident under investigation. (2) Except for the FAA, no entity has a right to participate in an NTSB investigation as a party. (3) The participation of the Administrator of the FAA and other Federal entities in aviation accident investigations is addressed in § 831.21 of this part. (4) Participants in an investigation (e.g., party representatives, party coordinators, and/or the larger party organization) must follow all directions and instructions from NTSB representatives. Party status may be revoked or suspended if a party fails to comply with assigned duties and instructions, withholds information, or otherwise acts in a manner prejudicial or disruptive to an investigation. (d) Party agreement. Except for representatives of other Federal agencies, all party representatives must sign the "Statement of Party Representatives to NTSB Investigation" (Statement) upon acceptance of party status. Failure to timely sign the statement may result in sanctions, including loss of party status. Representatives of other Federal agencies, while not required to sign the Statement, will be provided notice of and must comply with the responsibilities and limitations set forth in the agreement. Operator: Renfro's Alaskan Adventures, Inc. I didn't see it in the report but the rules when I was learning to fly were "East = odd thousands + 500" and "West = even thousands + 500" for VFR flight. My thought is the Cessna pilot should have continued to climb another 1000 feet before leveling out. The VFR cruise altitudes only come into play above 3,000 AGL. I Didn't see the weather report either but I'd guess they were both skud running.